We had a forecast of heavy rain a few days ago. Now that can sometimes mean we don’t actually get any but more often than not we get at least one day of it. When rain comes here it is usually pretty heavy and as I had been trying to leave harvesting my grapes till the last minute I decided that I’d better get on with it otherwise there would be none left. I collected two wheelbarrows full, it was quite an effort standing on a plastic chair and reaching up using muscles not used in a while. I only fell off the chair once but that was enough. 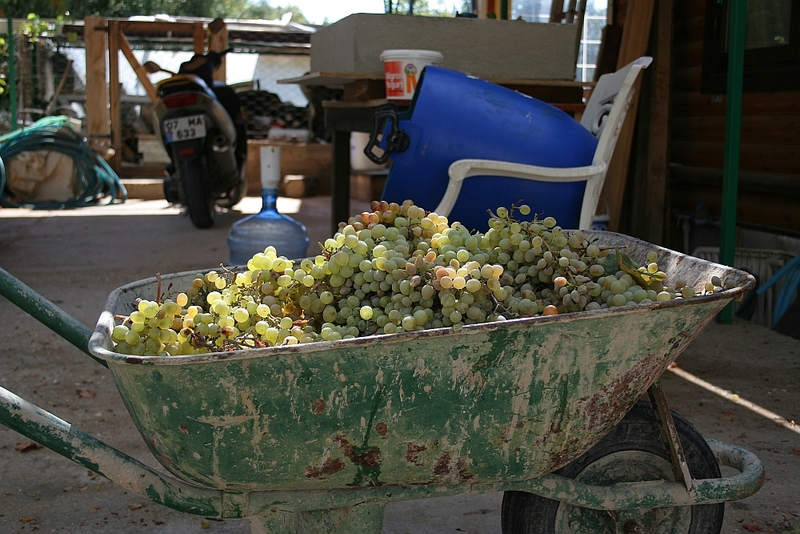 Treading grapes is not the most efficient way of extracting the juice by a long chalk. The grapes keep squidging up between your toes and around your feet. What you could do with is a couple of things like big potato mashers strapped to your feet, but then you’d also need a bigger container to do it in. I only had a blue plastic barrel that swimming pool chemicals had come in so I just had to make do with bare (but washed) feet. I’ve used two large water bottles to do the first fermenting in, 38 litres altogether. The fermentation was a bit slow to start but it is now well on the way. 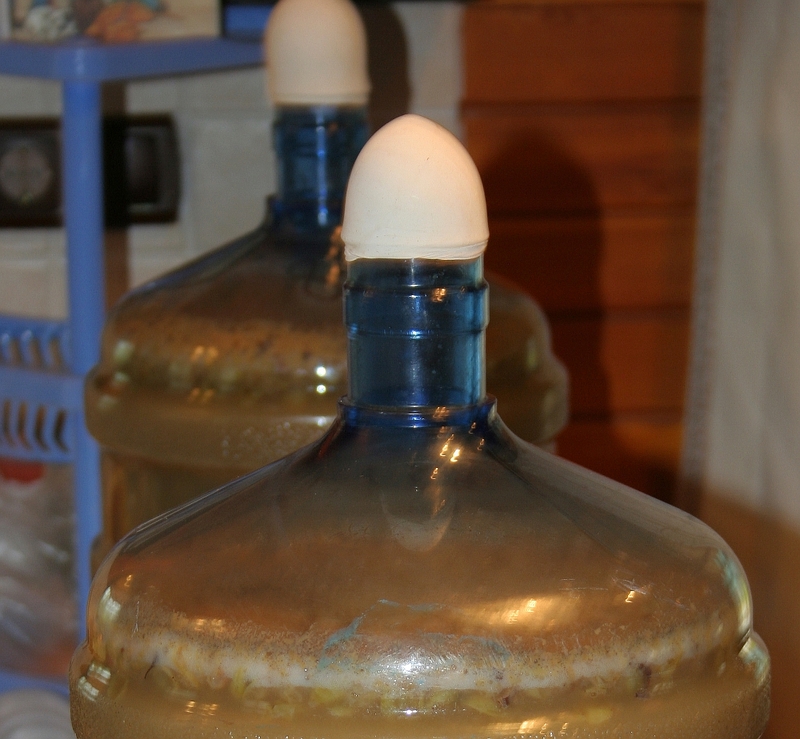 The white things on the top are balloons with the bit you blow through cut off and a couple of pinpricks made in them to let the gas out when the pressure makes them expand enough but stop the ingress of contamination when the fermentation slows down. I’ll let you know when I bottle the wine but I have to collect a few more bottles first. I’m using 1 litre screw top bottles like I did last time. It took three years for the last lot to become drinkable and very nice it was too. I’m looking forward to this batch being ready and in the meantime I’ll be planting some more vines at the front of the house, red grapes this time.